In February 1926, my parents took the boat from Haifa to Marseilles where they subsequently boarded a train to Paris. My parents settled in Montmorency, a town in the countryside named after the Count of Montmorency. We lived in a villa with very large gardens and a cherry tree, which I remember climbing to pick cherries. It was very quiet and there was plenty of open space for myself and two brothers to entertain ourselves and exhaust our energy in the fields. Our parents were very strict with us. For instance on one occasion they didn't know our whereabouts until about 7pm. My mother, who was the head of the family, punished us severely. We were not allowed out of the house for one week. But you must understand that I'm talking about 1928/29 and parents were generally stricter in those times. Unlike today, life seemed safer and more peaceful back then. We used to wander around unsupervised in the fields without any fear. We never heard of instances where children were taken away for no reason. I cannot even remember our parents locking the doors of the house. In October 1929, when I was a little over five years old I started school. Although children begin school at a younger age than five today, I do not have any recollection of attending pre-school. Around this time in 1929/1930, my mother gave birth to another boy named Avram (Albert). Around the time he started walking we moved to Enghien Les Bains, a suburb in northwest Paris. Rafael, his wife Esther and their daughters Rachel, Berthe, Frida and Elizabeth who was born in London. Enghien Les Bains was so called because it is a thermal city. There was a beautiful synagogue where we used to go for Rosh Hashanah and Yom Kippur. Unfortunately we had to go to school on Saturday as the only days off were Thursday and Sunday. On those days we went to cheder. In Enghien Les Bains we lived above Felix Potin, a big supermarket in Rue D'Enghien. My father worked in a marche, a market stall. 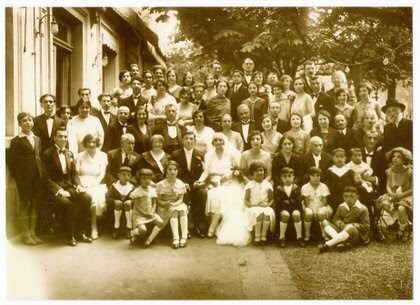 Because most of the mammon family lived in Enghien Les Bains it provided us the opportunity for family gatherings, especially on Jewish holidays. On Yom Tov we visited my grandfathers brother Emmanuel, as he was also considered a grandfather by us. We also visited the other members of the Mammon family. At those gatherings the children never uttered a word. We had to listen to the adults tell stories of the past in Russia, expressing how they longed for the good old days in Khokand and how they wanted to go back to retrieve the wealth they left behind. On the bottom right is Joseph's brother Michel (sitting), and in the second row standing is Joseph. 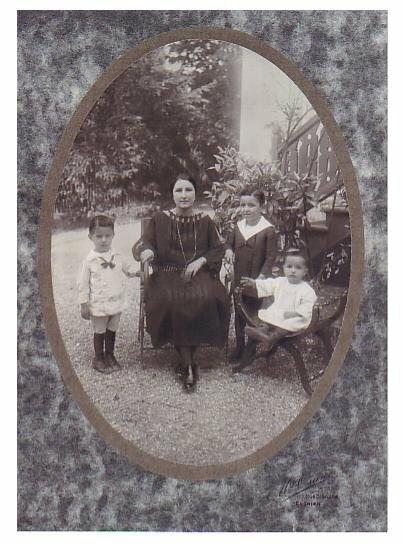 Joseph's baby brother Albert is sitting on his grandfather Benyamin Katan (sitting just to the right behind Joseph). The fifth person in the third row is mother Dora Mammon. The first child sitting on the left is Joseph's brother Charles.